Harrison School is a Preschool to Year 10 School that opened in 2008. Our school enrolment has grown considerably and is currently at 1400. The school has a Junior School catering for students from Preschool to Year 4. 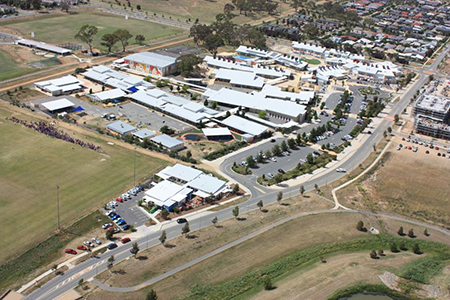 The Secondary School includes students from Year 5 to Year 8 (Middle School) and Year 9 and 10 (Senior School). The school ethos operates with a values and belief system that is reflected in the Values and Learning Statement. Our values are Respect, Inclusion, Teamwork, Endeavour, Resilience and Integrity. These values are clearly articulated with students and displayed around the school. A multi-aged approach to forming classes and learning groups is used that aims to build life long learners and leaders in our community for the 21st Century. Our curriculum engages learners in meaningful, challenging and reflective experiences that inspire all to achieve their potential and empowers students to be valued members of the wider community. Our learning program, developed using an integrated inquiry model, is guided by the Harrison Identity that organises learning into the Expressive, Analytical, Personal, Community and Global self. The School is implementing the Australian Curriculum and aims to develop empowered learners who are taking a greater responsibility in their learning pathway. Specialist programs provide learning in Japanese, French, Italian, German, music, drama, dance, band, chess, ICT, P.E. and information literacy. The school also offers extension and enrichment programs in literacy and numeracy. Each student has access to web-based learning programs including Mathletics (K-6), Mathspace (7-10) Language On-Line (7-10) and Reading Eggs (K). Personalised learning is a key aspect of Harrison School. All students develop personal learning goals or plans. Our secondary students use iPads to access learning information and the school's learning platform Schoology. Schoology is an online intranet that allows students, parents and teachers to communicate, access learning materials and work tasks. ICT is embedded in the curriculum and students have access to the latest technology to assist with learning. The buildings and infrastructure are designed to meet the IT needs of the various classes including, video conferencing, IWBs, laptops, iPads and computers. The school was purposely built with a range of environmentally sustainable functions which is incorporated into students' learning. This environmental perspective builds students' knowledge and understanding on solar energy use, recycling, waste minimisation and actions for improving our environment. The parent community is involved in a number of programs including classroom programs, canteen, fundraising, library, school fair, sporting teams and excursion support. We have established community sport teams in Netball and Junior AFL that participate in weekend sport. Students have opportunities to represent the school in a range of sports, cultural and academic activities. The Harrison School Board has elected parent representatives and leads the task of policy development and setting the strategic direction for the school. The Harrison School Community Association (HSCA) provides support to the school through managing the canteen, second hand uniform shop, fundraising and a number of committees. The staff and I look forward to working with you to ensure a quality education is provided for your child to achieve their personal best and potential.